New Neighborhood Watch Signs are Up! 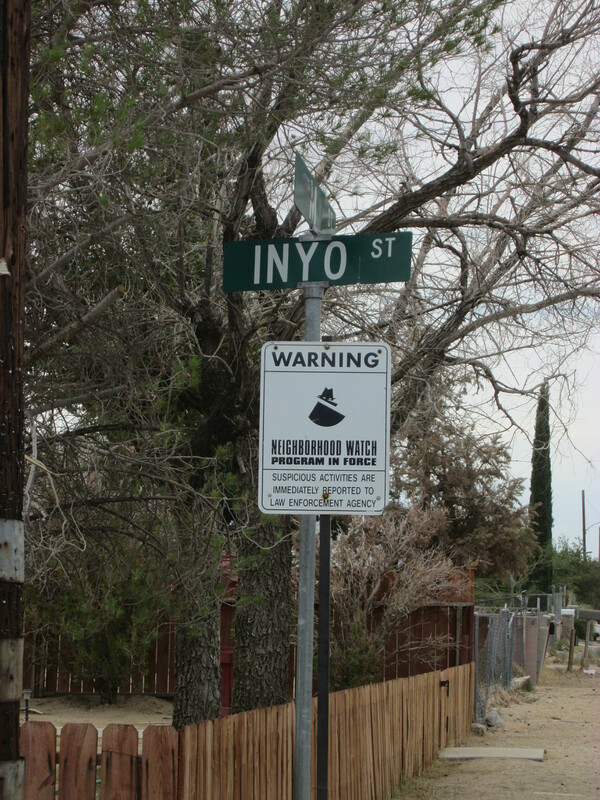 Debbie Crocoll from Mojave’s Neighborhood Watch group was happy to annouce that the vandalized, sun-faded, weathered and worn Neighborhood Watch signs at M and Inyo streets and also at L and Cerro Gordo streets were replaced by Mojave Foundation volunteer Leon Ryder early this week. The new signs look great! 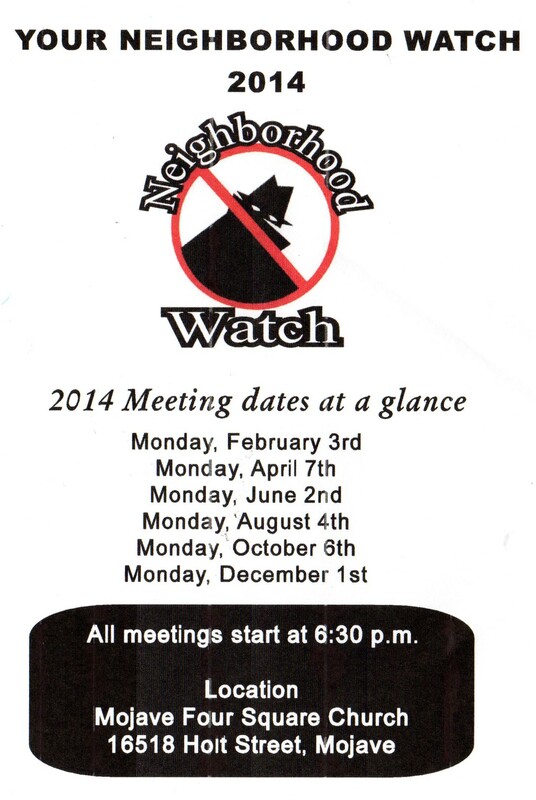 Contact Debbie if you would like to order an extra large (18″X 24″) Neighborhood Watch sign for $28.00 including shipping and tax. Thank you again, Leon Ryder for your continued dedication to helping keep Mojave SAFE and BEAUTIFUL! This entry was posted in Crime, donate, Neighborhood Watch, Safety, Uncategorized, Volunteer on August 7, 2014 by mojavefoundation. March 4: Deputies from Mojave arrested a suspect after an attempted break-in of an RV in the Denny’s parking lot Tuesday morning. Kern County Sheriff’s officials do not believe that the suspect was connected to the wave of burglaries in the Miracle Manor and Mojave Gardens neighborhoods of Mojave in November, December and January. The suspect was identified as a local Mojave resident who has been arrested 18 times since 2000, mostly for burglary, petty theft, and drug-related crimes, according to Superior Court records of Kern County. The 33 year old suspect was arrested again as recently as October, but KCSO officials claim that this individual is a typical product of the prison-release guidelines presented by AB109, which went into effect in 2011. This entry was posted in Kern County Sheriff's Office (KCSO), Mojave CA, Neighborhood Watch, Safety, Security on March 6, 2014 by mojavefoundation.